The Amazon has a long tradition of destructive interventions that separate culture from nature. Many of these developments take the form of a line in the landscape and offer no exchange between culture and nature, only an extraction from nature. These linear incisions occur in the form of deforestation and infrastructure. The practice of surveying, dividing, deforesting and demarcating the landscape, alongside infrastructure continues to carve destructive lines through the rainforest. This proposal explores the single formal gesture of a line in the landscape and the productive possibilities it may offer. 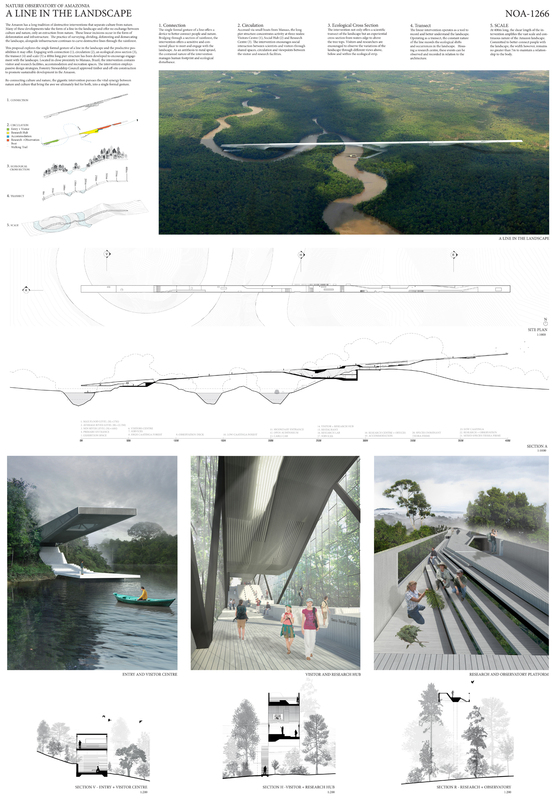 Engaging with connection (1), circulation (2), an ecological cross section (3), the transect (4) and scale (5) a 400m long pier structure has been developed to encourage engagement with the landscape. Located in close proximity to Manuas, Brazil, the intervention contains visitor and research facilities, accommodation and recreation spaces. The intervention employs passive design strategies, Forestry Stewardship Council approved timber and off-site construction to promote sustainable development in the Amazon. Re-connecting culture and nature, the gigantic intervention pursues the vital synergy between nature and culture that bring the awe we ultimately feel for both, into a single formal gesture.